How To Write The Article - All people make a blog, but after making it does not write the correct article, so in today's article I will tell you that how to write article and killer tips for write article. Nowadays, the craze for writing articles on social media sites, websites, newsletters, magazines and other journals is increasing. Article means to give a brief but full account of a subject. Or tell a brief but full solution to a problem. Just as there are races and struggles in the life of a human being, people keep running even on the internet in the same way. They read only the information or information that they can entertain, related to their life, or who are important in their perspective. The first catch of your readers is your attractive title. First of all, the title of your article should be such that as soon as the title is read, the desire to read it in the mind of the people begins to be born. The topic of your article is so strong, but your title is not that people want to read your article as you read it, then most people will read your article without reading your title and going ahead. Remember your title determines whether people will read your articles or not. First of all select a better headline, which inhibits readers from reading your entire article. In the lines of the beginning of your article, you motivate the reader a little bit why he read this article. You can make a brief description of the points on which you are going to write in your article. In the beginning lines, you can tell your readers why this article is important to them. The article should always use the word unapplied. Readers may be misled by your words. Therefore, take this into consideration whether the opinion written in the article or the presentation of the controversies is not misleading. Do not wander from your subject to write your article much longer. So do not forget to write important information on the other side of the round. Take special care of these two things. The thing to remember is that due to your title being good, the reader will start reading your article but the good information he wants is not. As you have written in your title/title, if you do not relate to it, then the reader will never want to read any of your articles further. That's why it is very important to have the same information related to the subject matter and the information you promised to give in your headline and beginning lines. When presenting your suggestions and suggestions through our articles, make sure that you are giving the right advice. Your articles should always be full of experience. Always select what you want to show in your article. A special experience, about a particular person, about an event special or related to a particular location. Self-sentimentality, or we should never use personal language in the article otherwise this language lets you deviate from your subject matter. It is paramount in keeping things in mind. The most appropriate language for the article is that common language that people easily understand. Do not use literary words and words that people do not understand easily. If there is any incident or experience of your life related to the topic of your article, then writing it briefly is better for your article. By doing this, people will be associated with you individually and they will actually understand the suggestions given by you. Finally, summarize the description once summarized in your article. Emphasize the main message, information or advice of the article. Ask your readers to do this, for the purpose you wrote this article. By remembering these things, by introducing a successful article, you can reach your information and experience to the people correctly. And it can also create a career by giving a new dimension and path to your writings. 1. First of all select the subject of the article which people need, people benefit from it, because without the benefit nobody will read your article. Like - new technical information, inspirational articles, earn money right from the internet etc. 2. Choose the unique and simple words to write your article. Try to give more information in the work terms. 3. Add 2 or 3 images best quality in the article, which will make the article look even more beautiful and if buy, then buy also image. 4. If you are writing a tutorial article, definitely add info-graphic to it. 5. Before writing an article, take all the information, read about it. Since you will have complete knowledge, you can give the right information to the people. If possible, add a daily routine to reading other blogs. Do not rush to write articles. 7. Articles write in two ways, focusing first on SEO and writing without SEO, but writing skill is good. 8. In the beginning, whatever type of article you write, do not underestimate others, because it begins with all the mistakes. Gradually improve your writing skills. 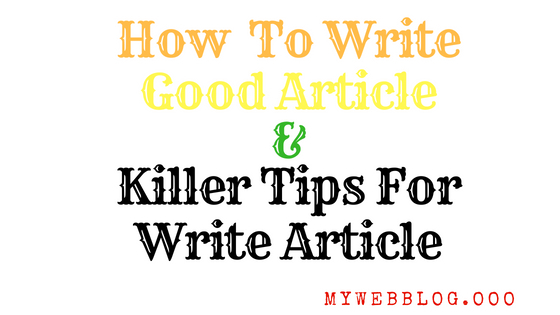 If you liked the article,(How To Write The Article | Killer Tips For Write Article) and with the help of this article it would have been easy to write articles.